The Di Salvo Engineering Group submitted the Eagle Hill School project into the 2018 ACEC-CT Engineering Excellence Awards. Chris Briggs, the engineer for this project, made a presentation to the judges on Tuesday, December 5. We are proud to announce that the submission has been selected as a winner of an Engineering Excellence Award. This award will be formally presented at an Awards Dinner on January 22, 2018. Congratulations are in order also to KGD Architects of Mt. Kisco, the architect on this project. Eagle Hill School in Greenwich focuses on children with language-based learning disabilities. The project was in two phases. Phase 1 included a new Community Room and structural renovations to an adjoining classroom building. Phase 2 included structural engineering services for the Hardwick House, which houses over 250 students. Check out pictures to come from the Awards Dinner in January!! TDEG is honored to have been involved in three projects that were recognized by AIA Westchester Hudson Valley on Wednesday, October 11, 2017. Pound Ridge Pool House in Pound Ridge, NY was awarded the High Honor Award in the Residential Category. The architect is Taylor-Viazzo Architects of New Rochelle, NY. TDEG also partnered with KG&D Architects, Mt. Kisco, NY, for the Eagle Hill School Community Room (Greenwich, CT) project. This project won the Honor Award in the Institutional Category. Thirdly, a project with Gallin Beeler Design Studio (Pleasantville, NY), the Hudson River Healthcare facility in Peekskill, NY, was given the Citation Award in the Institutional Category. Congratulations to all the recipients! Megan Brady, a 2017 graduate of Ridgefield High School, is this year’s winner of the Richard S. Di Salvo Memorial Scholarship. This scholarship is awarded annually to a graduating senior at Ridgefield High School who will be going on to study Engineering. Megan was presented the scholarship at Senior Awards Night on Thursday, May 25. She will be attending the University of Michigan. Her proud parents are Kristie and Ken Brady of Ridgefield. Congratulations Megan! Employees at TDEG again raised money for The American Heart Association. The Spring “Heart Walk” was on Saturday, April 22. The day was a wet one, but Eileen Sala, Susan Brouillette and Ken Jones, with Ken’s daughter Maggie, attended the walk around Sherwood Island in Westport. All together TDEG raised $2,300 for the Fall & Spring American Heart Association fundraisers! Bruce Richardson helped bring awareness to the field of Structural Engineering to many students at Shepaug Valley School in Washington, CT. 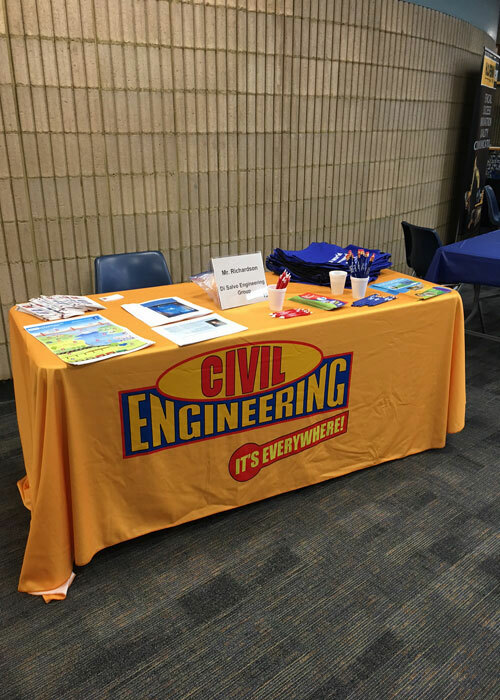 He met with students in Grades 6-12 at the school’s Career Fair on Friday, April 7th. There are surely some students who may have Structural Engineering in their future! The Di Salvo Engineering Group is honored to be receiving a Merit Award for the 2017 ACEC/CT Engineering Excellence Award competition. The project entered was The Prospector in Ridgefield, a state-of-the-art movie theater with a deep connection to the community. The Prospector provides vocational training in meaningful employment for adults with disabilities. The building replaced a movie house that was built in 1939. The architect for this award-winning project was Doyle Coffin Architecture of Ridgefield, CT. See the group picture at the Awards Dinner on our “Did You See This?” tab. Two of TDEG’s projects with Gallin Beeler Design Studio were recipients of the 2016 AIA Westchester Hudson Valley Design Awards. In the Unbuilt/Institutional category North Bellmore Public Library received a Citation Award. In the Municipal category, 333 Broadway, New York Entry Plaza received an Honor Award. TDEG is pleased to announce a new member has joined its staff. Tianming (Tim) Ma is a graduate of Guilin University of Technology in Guangxi, China with a Bachelor of Science, Civil Engineering. In May 2016 he graduated from Rensselaer Polytechnic Institute with a BSCE and Master of Engineering, Civil Engineering. Welcome Tim!